Starring: Andrew Garfield, Vince Vaughn, Sam Worthington, Teresa Palmer, Hugo Weaving, Rachel Griffiths, Luke Bracey. It’s been hailed as the big comeback of Mel Gibson, who, for the past few days, has been somewhat lost in the world, after a series of events which put him out of favour with the public and the film industry. 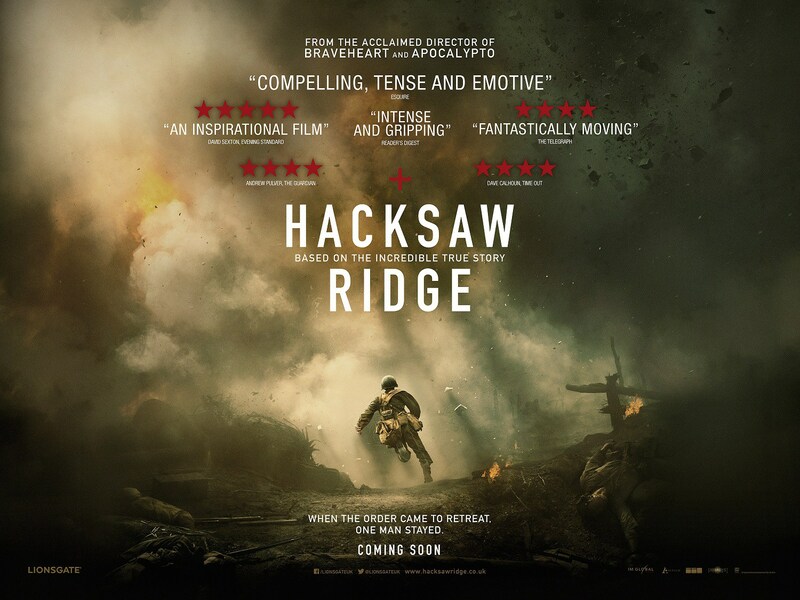 With a strong reputation behind him as a director, winning an Oscar for his epic historical drama, Braveheart, he now returns to the field of battle with this true story of a man who refused to use a gun during the battle at Hacksaw Ridge, yet was hailed as a hero. While this is playing right into Gibson’s hands, this isn’t the triumphant return I was expecting. 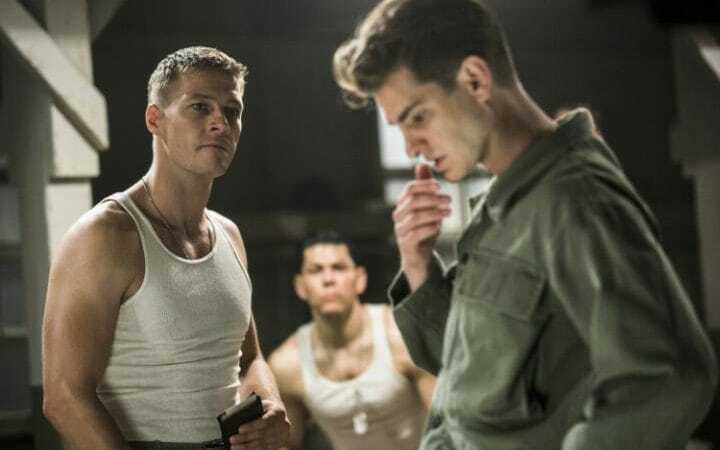 Desmond Doss is a young man living in Virginia with his brother, his mother and his former soldier father, who has strong attitudes about fighting for your country. As the world fights during World War II, Doss decides to sign up, hoping to be part of the medical corp. However, his training insists that he learn about using a gun. Doss is a conscientious objector and refuses. This doesn’t go down well with his sergeant or the rest of his platoon. After a long court case, he is allowed to join the rest of the soldiers in the South Pacific during the Battle of Okinawa where something incredible happens. This is a film of three parts. We get to see Doss growing up in his small town, falling in love with a local nurse, his conflict with his heavy-drinking father and his decision to enlist. We then get his basic training, which is where we discover his disdain for violence and the war he has with the authorities which could lead him to a court marshall. 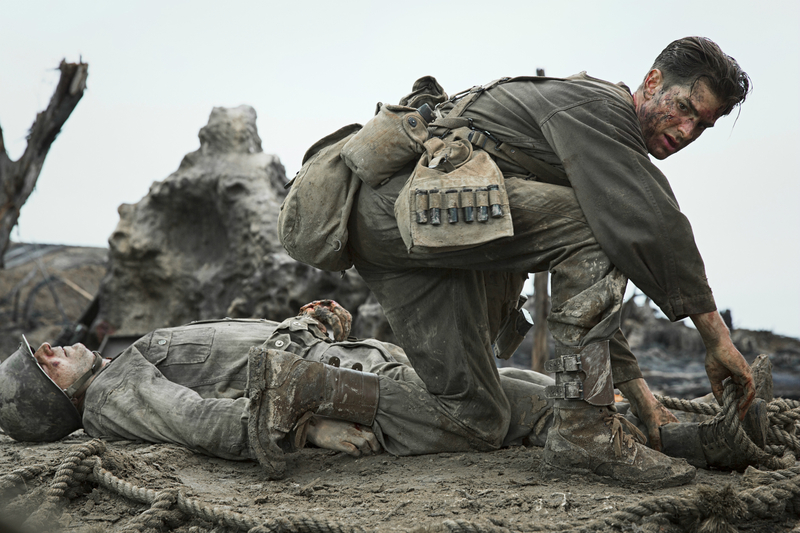 The final part is the battle at Hacksaw Ridge, which lasts for an hour of the film’s running time and plays into Gibson’s hands, where we get to see his strengths as a director. However, while the scenes or war are brutal and incredibly violent, where we are thrown into the heart of the fighting, experiencing the death and horror all around, in a battle that seems like the Americans will never win due to a lack of troops, the first half of the film doesn’t fair quite as well. In fact, it’s all a little cheesy and cliched. The scenes in Doss’s hometown, where he woes Nurse Dorothy and decides to fight for his country wouldn’t look out of place on Channel 5 in the afternoon. It’s drips with sentimentality, not helped by a soundtrack consisting of wailing violins to signify that we should be emoting with the main characters. It doesn’t work. We then jump to Doss’s training, which ticks all the boxes of the usual man-joins-army war films, with a tough drill sergeant and a platoon filled with “interesting” characters who are split between the tough, the mildly amusing and the caring. As soon as Doss announces his thoughts on guns, he becomes the victim. He is picked upon by his drill sergeant, quietly persuaded by his kindly captain, bullied by his troop and frowned upon by the higher ranking officers who want him either thrown out of the army or thrown in jail. While this is filled with cliches, it actually is the more interesting of the sections, as Doss strongly holds onto his decision, regardless what is thrown at him. Which leads the spectacle of the piece, the lavish yet gritty battle scenes, where bullets fly in the faces of soldiers as the heroic Doss dodges the bullets to save those who are injured. This is an incredibly visceral sequence, that doesn’t hold back on the horrors of war. Where the problem lies is that at almost an hour, it soon becomes repetitive and so boredom soon sets in. It also doesn’t help that the previous parts of the film don’t have enough punch to make us really care about the characters. The performances are all fine, with Vince Vaughn, as the drill sergeant, showing he is more than just a comic actor and on occasions, stepping away from the usual shouting, hateful man in charge to something a little more understanding, especially during the later parts. Andrew Garfield, as Doss, commands the screen. He is almost in every shot and so has to have a presence of a man wanting to be patriotic and yet refusing to use violence to do so. He manages to make even the dodgiest pieces of dialogue in the first section sound believable and you can see him running through the explosions to save his fellow soldiers. Hacksaw Ridge has moments of Gibson at his finest. he is a terrific director of action and large-scale epics yet he struggles with the more intimate moments and allows himself to coast during the training scenes, relying on what we know already. It’s not a terrible film, it just lacks the bite that we’d expect from an Oscar winner.